The Artificial Hair Extensions Guide. What Are Artificial Hair Extensions? "What are artificial hair extensions?" Artificial hair extensions basically hair extensions that are not made from human hair; instead they're made from a synthetic material; so let’s take a closer look at these little synthetic gems to find out if they’re right for you. Synthetic hair extensions are usually monofilament fibres and polyfilament fibres like acrylic, modacrylic, polyvinyl, polyester and nylon. Monofilament, or monofiber, is a high quality woven linen material used to make hairpieces. It is typically used in permanent weaves and is very durable. Toyokalon is a synthetic fiber made in China that is highly heat resistant so that it can easily be styled. Kanekalon is another Asian fiber material that is commonly used to make synthetic hair. It is versatile and holds braids and styles well. It is lighter than most synthetic fiber. Quite simply they are made of synthetic materials, so if you feel uneasy about human hair extensions then these are the extensions for you! What Type of Artificial Hair Extensions Are There? We were going to say that "every type of human hair extension has its equal and opposite synthetic hair extension", but it didn't seem right to mash up of Sir Isaac Newton's great work on the laws of motion and our so-so (meh) work on hair extensions. Instead, we'll say that every type of human hair extension has its synthetic hair extension counterpart. The great thing about synthetic hair extensions is that they're available in a whole host of colours from the regular every day colours to fancy colours. 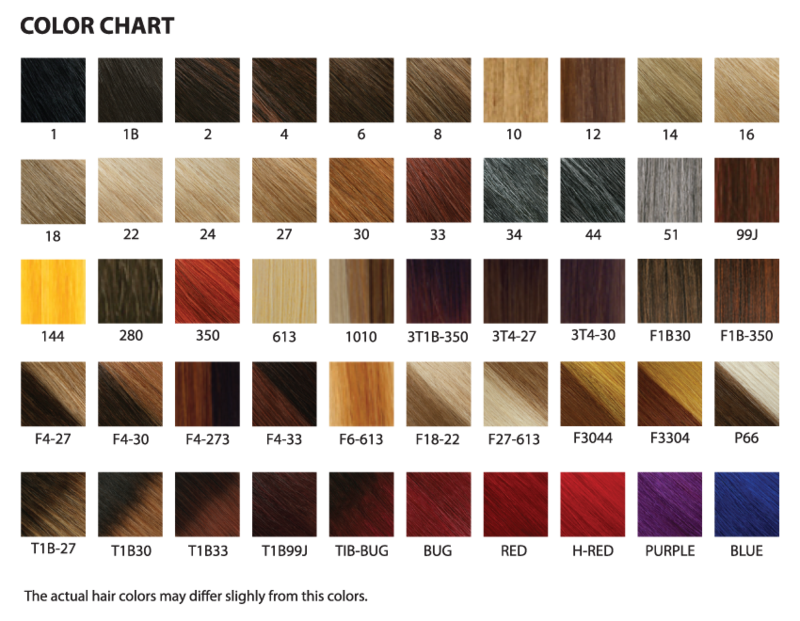 The range of colours available allows you to closely match and blend colours to your own growth hair. They can also come in bright colours so if you’re after a funky new look then they can be just the ticket! Image source jazzwavehair.com - image can be enlarged twice; click to enlarge then look for the expansion box top right hand of the enlarged image window. "Will The Hair Look Artificial?" If you get neon green hair then yes they will! If however you are after something that matches your own growth hair then you’ll find that if they’re attached well, they will blend easily with your own hair as long as the type of synthetic hair is not particularly shiny. As always there will be a level of care and maintenance needed for synthetic hair extensions and you can learn about how to care for synthetic extensions here. That's the amble through artificial (synthetic) hair extensions. If you have more questions about hair extensions why not check out the Your Hair Extension Questions, Answered section; or if you'd like to be first to read new guides and articles about wigs, hairpieces and hair extensions, join our blog - it's super easy to do and doesn't require any personal info!